Superb advice for anyone intending to crowdfund. From planning to choosing rewards, pricing, creating a video, and selecting a crowdfunding marketing agency – listen and learn! Most folk running a crowdfunding campaign might be nervous with 18 days to go. Not Allen Holland. His business’ Kickstarter campaign for the NESSH Jacket, “the warmest jacket in the world,” smashed through its target within 24 hours. As of today (24/11/18) the campaign (with an original goal £15,000) has secured over £54,000 in orders from keen backers. They love the product. They also love the company’s One Sold, One Given promise – more on which below. It was a great pleasure to interview Allen on yesterday’s Business Live radio show, and you’ll enjoy the podcast below. He’d been in the studio briefly 3 weeks ago. This time we had the chance to properly explore Allen’s business. NESSH Jackets are being sold to keen outdoor enthusiasts on a direct-to-consumer basis. 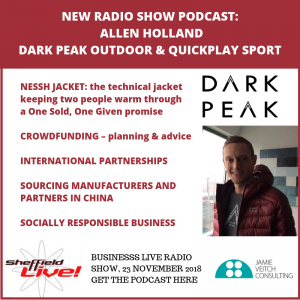 Allen explained how this means their highly specified jacket, designed specifically for the needs of climbers, walkers, and other outdoors-folk, can be offered at an excellent price. And for every NESSH Jacket that is bought, a jacket is given to a person who is affected by homelessness. Again, the jackets being given to people without shelter are designed with their needs in mind. A lightweight, down-filled jacket is ideal for a climber – but would be useless for someone who is homeless. In our conversation Allen explained how the business has worked with homeless people and charities to ensure the jackets they will donate are fit for purpose. Given the success of the crowdfunding campaign, I picked Allen’s brains. He has superb advice for anyone intending to crowdfund. From planning to choosing rewards, pricing, creating a video, and selecting a crowdfunding marketing agency – listen and learn! Allen also ran us through his history as a product designer and some prior successes and challenges. This was fascinating. He previously co-founded QuickPlay Sport whose portable Kickster football goal became the best selling football goal on Amazon. This led to product licensing to a large US firm – and Allen taking a design role in California for several years, developing other products, before Allen and his wife developed a US division of QuickPlay Sport. Having built up manufacturing contacts in China over several years, Allen has plenty of tips about this too. There is brilliant advice in this episode about finding manufacturers, sourcing agents and quality assurance partners. You also still have an opportunity to get hold of a NESSH jacket at a bargain price – and at the same time have another jacked donated to a person affected by homelessness through their One Sold, One Given promise. 53:00 – 54:40 wrapping up and a preview of next week’s PechaKucha Sheffield. Share this episode via the buttons below.